The beginning of the year bulletin boards and new door decor is up! Silly me for making the door look like a chalk board, and actually using chalk! DUH! Not the smartest thing I’ve ever done. White paint marker to the rescue! I need more wall space!!! It’s wintertime here in Texas, and since we are in the southern part we really don’t see snow very often. But we’ve got it here at Mark Twain! 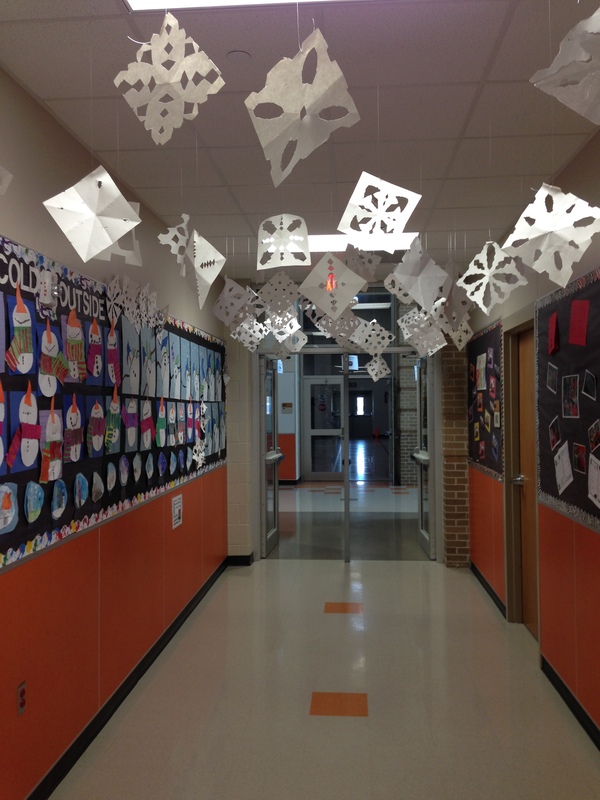 3rd, 4th, and 5th grade paper snowflakes hang from the ceiling. Our music department was planning an awesome holiday musical, and the art department was enlisted to assist with the set. 3rd, 4th, and 5th graders were taught to make paper snowflakes, and they did look beautiful on the stage, but we ended up with tons with no home! So here they are! Hung for all to see in the art wing! They made a wonderful addition to our winter projects! Kindergarten always needs reinforcement of their motor skills, so they practiced cutting and gluing and made snowmen looking up at the falling snowflakes! 1st grade learned all about snow globes! We discussed what you can find in them, and one teacher even had on a snow globe sweater, which she modeled for the children! After our lesson the kids then cut out circles to make their snow globes and drew with watercolor pencils. When finished they painted with water, and watched their color pencil turn into watercolor! The next time they came to the art room, they then cut a larger circle and a base for their snow globes and got a bit of glitter! Finished 1st grade snow globe. 2nd grade learned all about artist Vincent Van Gogh and his Starry Night painting. We watched a video where the wind and the stars really moved! Then we discussed what was it that made the actual painting look like it moved. After this we briefly talked about the word silhouette, and looked at a few examples. We then put both of these together and made “Van Gogh Winter” scenes! 3rd grade learned about perspective and what worm’s eye view is after the lesson we drew snowmen using a worm’s eye perspective! 4th grade learned about the Nutcracker Suite, and watched a video that wrapped up the ballet in under 5 minutes! After watching the story of the Nutcraker, then we looked at a few examples of them, then we drew our own using basic shapes! 4th graders working out their nutcrackers. 5th grade learned how to printmake! They were told to think of the things that pop into their head when the words “winter wonderland” is said. We looked at a few examples of pictures after Googling the phrase. Then they went back to their tables to brainstorm scenes. They sketched out their ideas, and then drew them onto styrofoam trays. They then painted the trays with white paint, and then printed their image onto a piece of paper! I think they came out awesome! Here is the art on display!